ST. CATHARINES – Nancy Storrs has been overwhelmed with letters, phone calls and e-mails as her partner of 30 years, Jack Nicholson, struggled to recover from a stroke before eventually dying Monday night. None of the accolades and condolences for the rowing legend have hit the mark more than a note sent Sunday to Storrs from Niagara-on-the-Lake native and former Olympic rower Fiona Milne. “It’s like an eulogy and I just adore it,” she said. A portion of Milne’s note is printed below. “You have an extraordinary gift and talent of drawing out the best in athletes and making us realize our own potential that we have yet undiscovered, of being firm and task driven, but warm, supportive and encouraging as we strive to achieve and improve. “Of being caring and interested in our thoughts, lives and motivations, dreams and goals. Of being smart enough and courageous to rise above the politics of the coaching world. “Of being unconditionally generous of your time, energy and expertise to whomever seeks you out and is willing to put the effort in. “Of being so dedicated, reliable and dependable to always be there for us in those early mornings, late evenings and extra sessions. Of wanting nothing in return except for seeing the gratification of a good result, a personal best or purely just a good row. Milne’s words were echoed by many who visited Nicholson in hospital before his death. The 2014 inductee into the St. Catharines Sports Hall of Fame and former Jack Gatecliff Award winner began his rowing career as an athlete at St. Catharines Collegiate in 1948 and would go on to become a boat builder, coach, club captain and organizer. He coached at countless secondary schools and universities and helped start programs at Sir Winston Churchill, Niagara District, Ryerson, Waterloo and Brock. Nicholson started coaching fours and eights, but focused much of the last 40 years on sculling and helping rowers achieve their ultimate goals of representing Canada at the Olympics and Pan Am Games. Coaching at Ridley College and with the Ridley Graduate Boat Club since 1972, Nicholson achieved countless honours including Rowing Canada’s coach of the year in 2004 and 2005, RowOntario coach of the year in 1999 and RowOntario’s President’s Award in 2005. When interviewed this spring prior to his induction into the St. Catharines Sports Hall of Fame, the 82-year-old St. Catharines native said his motivation was simple. This past spring, he was doing three coaching sessions a day, starting with Ridley Graduate Boat Club members at 7:30 a.m., Ridley College students from 4 to 6 p.m. and club rowers again from 6:30 to 8:30 p.m. In an earlier article on Nciholson, former national team rower Fraser Berkhout, a member of the Ridley Graduate club, said he benefitted from Nicholson’s work ethic. The veteran coach would be there for Berkhout if he wanted to row one, two or even three times a day. 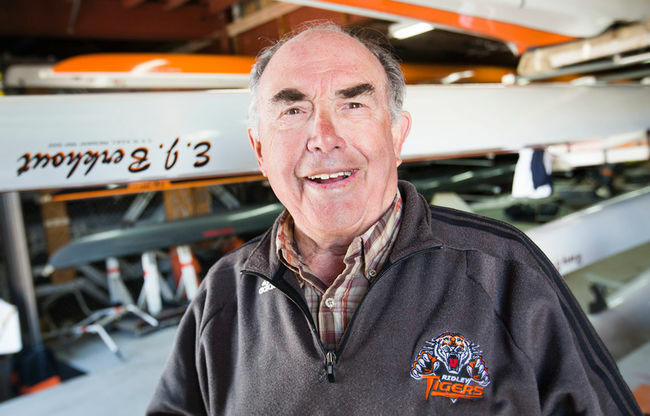 Former rower Doug Hamilton Sr. described Nicholson as special from two perspectives. Hamilton was in a Nicholson-coached quad that won gold at the 1985 senior worlds and bronze medals at the world championships in 1986 and 1987. “He’s got a great eye for technique, so he’s technically very capable. But more importantly, he’s really good with the athletes and he understands what motivates them and what helps them to get better,” Hamilton said. Like any coach, Nicholson loves to win, but he told The Standard it wasn’t the be all and end all. He is survived by Storrs, daughters Carey Williamson and Tracy Nicholson, two grandchildren and his brother George.